It seems like just the other day I wrestled with those words. It’s amazing how quickly time moves. More than that, it is amazing how dramatically God transforms. May 27th, 2015 was the day I gave up. After almost a year of living under intense depression and anxiety, I didn’t know what else to do. I felt lonely, panicked and overwhelmed. Hiding in my bedroom, I decided the nearest sharp object to me was the answer. I didn’t care anymore that I knew I wasn’t supposed to do it; all I cared was to drown out these feelings, and cutting seemed like the most promising way. I had found myself thinking about it many times before. I could picture it in my head, and I could feel the itch of it on my skin. I always told myself I wouldn’t ever fall for it though. For one, I didn’t have the guts to actually cut my skin, that’s gross, and besides that, it was obviously just crazy to do. Yet those thoughts and feelings persisted. I tried drawing on myself as a substitute to cutting, but at the end of the day I was still frantic and still had no relief. My resolve wore thinner and thinner. Anxiety and heartache can take you to places you never imagined you would go if you allow it to, and I was tired of fighting. After a while of thinking about it, it didn’t sound so radical or drastic to do. It almost even sounded logical. I needed a way to release these feelings trapped inside of me. So when that night came, and I hurt, but I couldn’t cry, and I felt like I had nowhere to run, and I forgot the God who had carried me through the past trials of my life, I turned to a blade instead. At first it seemed good, I had done something about my pain. There was a level of satisfaction in that. But it quickly left. What had I done? Didn’t I promise I would never go here?! I had failed, and I had lost everything. The memory of what I had done to myself only made that night darker as I tried to fall asleep, and the following day just became even more anxious and painful. I told my parents what happened, and I promised them never again. I cut myself again several times over the next week or two. And I made sure not to let anyone know this time. Not one single person. I couldn’t last very long in between cutting…while I felt better as I was doing it, that feeling stopped so quickly after I was done. It was like being pulled down into a vortex that just swallowed you up. Quick, slippery, frantic, swirling, falling, dark, helpless. But even as much as I hated it, I was determined to run full on into it. If I dove in deep enough maybe it would finally be enough to get me away from everything. My plan was good to go, until it got interrupted by God. June 28th, 2015, we left for Jackson, MS, so I could go to Ballet Magnificat’s Summer Dance Intensive. I was staying on campus this time instead of with my family in a hotel like I had the years before. I figured this would work well actually, because there would be no one to stop me during those two weeks. However, as my parents left and I stood there alone in the dorm room, I felt something deep down inside, buried under my stubbornness but still alive and steady, assuring me I had to let God change my heart here during this camp. Before that voice faded, I wrote a note to myself saying, “Whatever it takes. Do it!” Sometimes staring at those words was the only thing that made me hold on, and I almost gave up several times, but in my moment of crisis God always showed up with a reminder of His love for me. When you’ve been living your life trying to control it all yourself, it is painfully difficult to remember how to surrender and trust God to have the reigns, but it is necessary and it is worth it. He will pull your fingers open as gently as you allow Him to. I didn’t notice it happening, but God changed me drastically during those two weeks in Ballet Magnificat’s intensive. At the end of my time there, I wrote out what God had shown me about anxiety and my desire for control over my life and emotions. I was seeing then that I could go to Him when I was anxious and overwhelmed and He would hold me. I was realizing that I could dump my emotions – even the ugly ones – on Him and that He could heal the hurt better than any cover-up trick I could try, if only I would trust Him to take care of my heart in His way and His timing. He is my Shelter from the craziness of this world and the craziness of my heart. I needed to remember these things. Coming back home, I worried about what would happen when real life hit again. Would I make it? Would I break again? I didn’t want to break; I actually wanted to get better now. But I was still so tired and worn down from my previous battles, did I have the ability to actually hold out and make it when things got hard? I looked online at people sharing stories of self-harm. They talked about how they had gone seven months without cutting, or three years free from it. It felt somewhat depressing. I had barely made it two weeks without cutting and many times I felt like it would kill me to keep fighting it. How could I ever reach seven months?? Today, June 28th, 2016, I celebrate one year free from cutting! It was not impossible. I could not have gotten myself out of it, but with God, all things are possible. It is not us working our way out but simply being open and surrendered to His work in our hearts that brings us freedom and lasting victory. For those of you who struggle with cutting or self-harm, either that the thought keeps chasing you or that you feel stuck going back to it, please know that God understands your pain and He is the only true Healer of our hearts. You may be able to trick your brain for a short time by hurting your body, but in the end it is only hurting your heart further. By giving up on running from your pain, and instead facing it and bringing it before Jesus, He can offer a deeper, truer, comfort and He can mend the brokenness. His love is deeper than your skin, just like your pain. He can reach you more fully than a blade can. The relief won’t feel the same as cutting does, but it will be more complete and long lasting if you wait patiently at His feet and keep coming back to Him. To anyone who struggles, whether it be with self-harm or something totally different, whatever sin it is that you feel like you won’t be able to stay away from, that you are doomed to be drug back there forever, that you don’t know if you really do have the strength to get past: you really can make it. You can break free. You can leave the old patterns and lies behind. You don’t have to keep going back, and you don’t have to fear messing up again once you stop. Yeah, you may trip, but God understands and has compassion on you. He won’t condemn you. You can instantly run back to Him for a hug when you do mess up. But also, you don’t have to trip! If you simply focus on keeping your gaze locked on Him, you won’t have to worry about sin suddenly pulling you down. He will keep your feet from slipping and will teach you to walk in His will. It is possible for “never again” to realy mean never again, if you lean on your Savior’s strength and not your own. 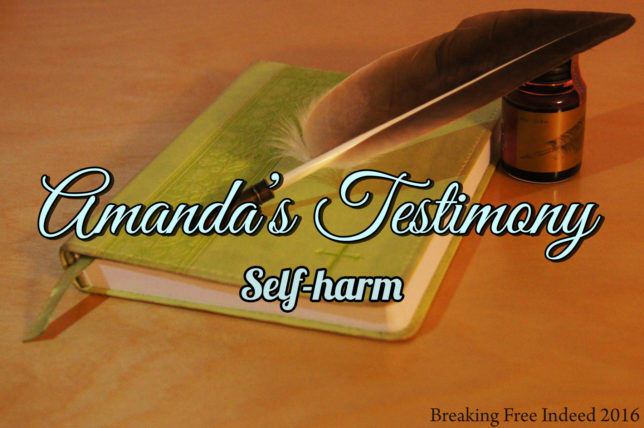 Beautiful and encouraging article Amanda! Thank you for the time and heart you put into it! LOVE THIS!!!!! Thanks for your transparency, it is powerful! Thanks for sharing and congrats!!!! ❤ to God be the glory! This is powerful, Amanda. My youth pastor was saying the same thing to me a few weeks ago (about a different topic) and I didn’t really understand it exactly, until now. That you for being so clear and transparent. God has truly given you the gift of writing to help others. You’re welcome, Trent! And thank you, all the glory goes to God for both my freedom and the work He does through my story! 🙂 I’m really happy to know how God used this to speak to you. This is so powerful Amanda. God bless you for your courage! Thank you for this, it encouraged my heart.